One night. One group of restaurants. And one fruit vegetable (argue at will). I enjoy tomatoes probably more than the next person yet was skeptical – multiple courses all featuring tomatoes? I could see the tour was to be taken seriously as the tomato growers themselves (from Coastal Organics in Oxnard) were along for the preview. We got firsthand tastes of the Patina Group’s utilization of their prized produce in a farm-to-table take that is the focus of so many restaurateurs these days. And utilize, they did, from using oil made from tomato vines to concocting an actual tomato dessert – the latter of which I thought had good effort with what was given but wouldn’t order. It’s always a party with fellow food writers. Also there: Liz of Food She Thought, Neil of Food Marathon, Matt of Dig Lounge, Cat of Gastronomyblog, Lindsay and EliseÂ of LAist, Hadley of GrubStreetLA, H.C. of LA-OC-Foodie – to name a few. We allÂ started out at Nick & Stef’s Steakhouse. It was my first visit and it turned out to be a very pleasant one. As an introduction to how much we all really did not know about tomatoes, a different kind awaited each of us at our place setting with a request to guess what kind it was. Short of guessing, “red,” I got to get familiar with the color and texture of mine, which turned out to be a Mondrian Cross. No matter. I may not be able to memorize my tomatoes but there were many in the appetizer, which was absolutely delicious. Chef Brian Kiepler kept it simple yet fresh. After inquiring about the dish, I found multiple kinds of heirloom tomatoes were used – specifically Brandywine, Big Zebra and Cherokee. They were seasoned with a grilled pineapple chutney including onion capers, and drizzled with banyuls vinegar. After Nick & Stef’s, we enjoyed a short walk over to CafÃ© Pinot and caught the last of their happy hour – which was actuallyÂ impressive. H’ors doeurves such as salted watermelon with ahi tuna and three different kinds of gazpacho (made from yellow, green and red tomatos) were delightful and appropriately lightweightÂ for the hot downtown summer night. 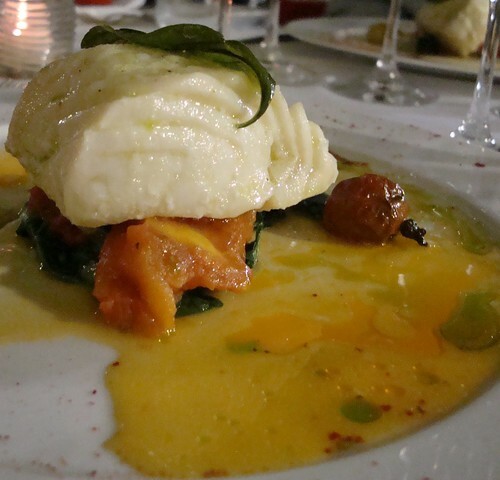 The entree, however, was the real centerpiece as our halibut filets were poached in 120-degree oil (that is, olive oil infused with tomato vines) by Chef Kevin Meehan. This gave me a different take than I was used to on halibut, which for a whitefish is usually at least a bit flaky. But this filet surprised me and was extremely moist. I also liked the idea of using the entire plant, thereby making oil from the tomato vines and infusing the entire dish with the vegetable in multiple ways. The final stop on our walkÂ was Zucca Ristorante. There, they served a sort of heirloomÂ tomato sorbet – which was gritty and – I get the tomato theme they were going for, but to be honest a tomato sorbet is not something I would order. But good effort. I went straight for the shot of espresso. 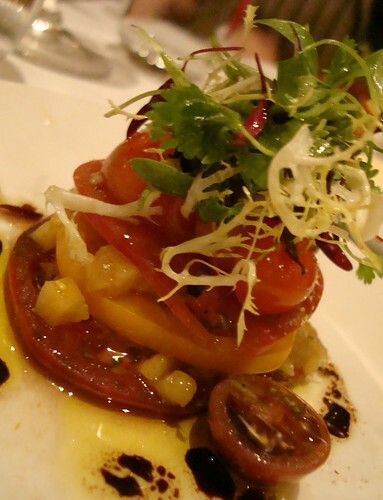 The heirloom tomato appetizer atÂ Nick & Stef’s left me wanting to revisit for an extended experience. I had visited CafÃ© PinotÂ before and my happy hour and halibut experience this night solidified my positive impression of the downtown restaurant. What’s more – the outdoor patio is absolutely beautiful and it’s no wonder that it’s the only free-standing Downtown Los Angeles restaurant. White lights adorn all the trees in the beautiful outdoor area that is actually shared with the adjacentÂ library – no wonder they are booked for the year just for weddings alone. As for ZuccaÂ -Â I had visited such a long time ago and the tomato dessert made it difficult to get an accurate impression on the place. Perhaps another time I can get a better gauge for things there. However, the real cap on the evening was unexpected and, juxtaposed with the farm-to-table tomato theme of the night, rather outlandish.Â Yes – it was indeedÂ luxurious but I am still tickled when thinking about it. The PR group representing Patina had somehow gotten usÂ journo-bloggers a Hummer stretch limo to take usÂ back to ourÂ original meet-up spot! Â Sustainability, in theory. I appreciated the grand gesture, though. 😉 I will certainly be by at least a couple Patina restaurants in the near future. This entry was posted in Downtown LA, Food and tagged CafÃ© Pinot, Downtown LA, Nick & Stef's Steakhouse, Patina Group, tomato, Zucca Ristorante. Bookmark the permalink.